Tilray said it raised 60 million Canadian dollars ($47 million) in financing that will allow the licensed producer to ramp up marijuana production capacity nearly fivefold this year to meet demand in Europe and Canada’s rapidly expanding medical cannabis markets. The additional money puts Tilray in a position to increase annual capacity in Canada and Portugal to a combined 76,000 kilograms (167,551 pounds) by the end of 2018 and 142,000 kilograms by the end of 2019. The company’s current overall capacity is about 15,000 kilograms. The added capacity would put Tilray among the top tier of Canada’s licensed producers in terms of global financed cultivation capacity, behind only Canopy Growth, Aphria and Aurora Cannabis. Tilray’s financing was the first that was open to outside investors since Seattle-based Privateer Holdings founded the Nanaimo, British Columbia, company in 2014. Privateer declined to disclose the terms of the financing, including Tilray’s valuation, and how much it has invested to date. The company told Marijuana Business Daily it expects to announce a new processing facility in Canada in the coming weeks. In September, Tilray unveiled plans to build a medical marijuana production facility in Portugal to serve demand in the European Union. That facility is now licensed, and genetics were imported from Canada for plants that are currently growing indoors, according to Zack Hutson, vice president of corporate affairs. Construction has begun on a greenhouse that will produce 33,000 kilograms of cannabis annually starting later this year, he said. 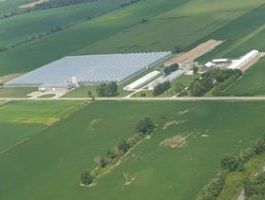 Tilray expects to have its facility in Enniskillen, Ontario, licensed and plants in the building in the coming months. The new financing allows Tilray to boost the production capacity in Enniskillen to 57,000 kilograms once the first phase is complete this year.